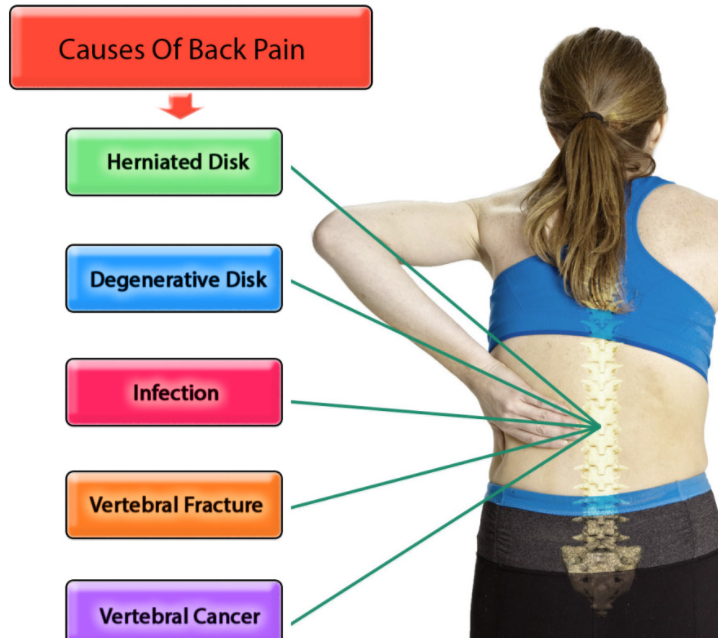 Causes of Back Pain: What Causes Back Pain? The back is made up of numerous muscles, nerves, bones and joints. This part of the body is a complex structure and one that commonly experiences pain. This can make it very difficult for doctors to determine the exact cause when pain occurs. When it comes to back pain causes, some are relatively minor, such as minor sprains or irritation, slight malalignment of the musculoskeletal system, or pinched nerves. However, in some cases the cause of back pain may actually lie in more severe sprains or strains, serious diseases, or damage to the vertebrae. 1 What Causes Back Pain? Back pain can be triggered acutely by many factors, including everyday activities such as lifting heavy objects or sports-related injuries. On the other hand, this type of pain can gradually develop over time and remain as a chronic condition. Lifting, pushing, or carrying heavy objects. Sitting with poor posture for extended periods. Exercising with poor form or with too much intensity. In many cases, there is an apparent reason for the occurrence of back pain. However, there are cases when people experience back pain without any known cause. There have even been cases where people have woken up with back pain without being aware of why and how they got it. Smoking. Smoking causes tissue damage in the body, including tissue in and around the back. Therefore, those who smoke may be at a higher risk for developing back pain. Being overweight. Those who are overweight can be more likely to experience back pain. If excess weight is the cause of back pain, reducing weight through exercise and healthy eating may be recommended. Pregnancy. Carrying a baby is also a factor in developing back pain. The position and weight of the baby can place added strain on the back, and many pregnant women suffer from pain in this region. Certain medications. Some medications, such as cortiocsteroids, can weaken the bones, especially if used for extended periods of time. It is important to understand the medications you are taking and their side effects, especially if you are feeling pain. Slipped disc or sciatica. If you feel pain in the lower back and it is accompanied by tingling and numbness that travels down the legs, you may be suffering from a slipped disc or sciatica. Arthritis. If you wake up with stiffness and experience joint pain when walking, you may be suffering from arthritis. Whiplash. Headaches, back pain, and neck pain that follow an accident can be indicative of whiplash. Causes of back pain range from minor to severe, from minor sprains and strains to infection or vertebral fracture. It’s important that you consult your doctor if you are experiencing acute or chronic back pain, especially if it is severe. While back pain is common, it can be an indicator of something more serious. Determining the cause with the help of a medical professional can reduce the pain and discomfort.